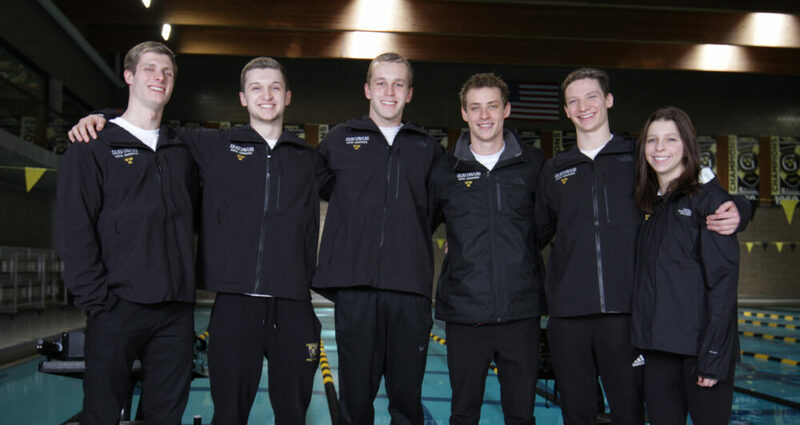 SAINT PETER, Minn. – Six Gustavus swimmers are preparing for the NCAA Championships in Greensboro, N.C., which takes place March 20-23 at the Greensboro Aquatic Center. Gustavus has qualified five men and one woman for the 2019 NCAA Championships – Matt Allison (Jr., Grand Rapids, Minn.), Dutch Franko-Dynes (Fy., Minneapolis, Minn.), Nolan Larson (So., West Des Moines, Iowa), Josh Muntifering (So., Buffalo, Minn.), Tanner Sonnek (Sr., North Mankato, Minn.), and Maggie Webster (Sr., Apple Valley, Minn.). Sonnek and Webster are the most experienced Gusties on the national stage, both making their third consecutive appearance at the NCAA Championships. Sonnek has earned three All-America honors, taking seventh in the 100 breaststroke and fifth in the 200 breast in 2017, and seventh once again in the 100 breaststroke last year. Webster claimed All-America honorable mention last year in the 50 free and was a member of the 200 free relay teams that earned honorable mention in 2017 and 2018. Allison also has national meet experience having gone in 2017 where he raced in the 50, 100, and 200 freestyles. Franko-Dynes, Larson, and Muntifering are making their first appearances at the NCAA Championships. Below is the event schedule detailing each event Gustavus is competing in with the seed and time.